We are coming out of our 'winter rest', late this year, because we had to cope with the FIFA World Cup (which feels 100 years ago), into a beautiful spring and early summer. Those visitors who arranged their trips for this period are indeed fortunate as we had a wonderful year for clivias, for bougainvillea, a fantastic year for roses, at the very moment, and the agapanthus are on its way. Take into consideration that the Giant Protea is also in bloom at the moment, the pincushions are very colourful, and of course the 2010 Sauvignon Blancs are now six months old and have settled very nicely and indeed it is a lovely time to be in the Winelands. 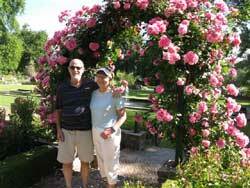 This year was a fabulous year for roses, and one of the best performances was at Rustenberg. Charlie and Pat Hart had the good fortune to enjoy it. 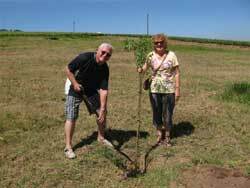 Stan Morris and Jan Attlesey popped in from the Addo in time to plant a tree at Muratie Wine Estate. The tree was a Karee, and Table Mountain was visible in the distant background. 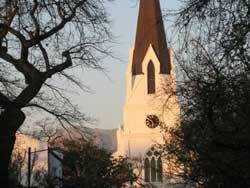 The Moederkerk (Mother church) at Stellenbosch is one of the pretty sights that one sees during a wine tour with Pietman. 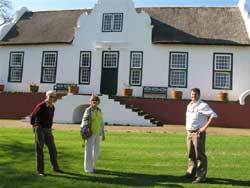 The Governor of St Helena, Andrew Gurr and wife Jean, visited me in Stellenbosch. They appear on the photograph in front of the Manor house of Rustenberg Wine Estate with Jurgens Schoeman of Live the Journey, who is arranging a trip to St Helena. It is at St Helana that Napoleon preferred Constantia wine while he was in exile. 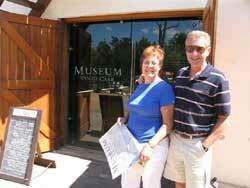 Roy and Hilary Alder showed an interest in the early history of the Cape and were therefore taken to the Museum van de Caab at Solms/Delta in the Franschhoek valley. Hilary recently obtained a degree in archaeology and really appreciated the artifacts relating to the stone age and iron age. Paul and Helen Baker tasting wine with the master himself, Kevin Arnold, co-owner of Waterford Estate outside Stellenbosch. By sheer co-incidence Kevin had lunch in Paul's restaurant in Surrey a week earlier. There are new wine estates, some of them revived by new owners after many decades of neglect, new restaurants, the one trying to outperform the other, new wine tasting experiences, new shows and festivals , so much more to enjoy. The major difficulty for tour operators is how to know what happens where and at what stage. The now famous and well known summer season at Oude Libertas Amphitheatre is again staging a very interesting progamme, and visitors can be assured of some of South Africa's top artists. There is great variety of performances, from music to theatre to visual arts, and from flamenco dancing to opera, and from jazz to the bicentennial celebration of the birth of the Polish conductor Frederic Chopin, and much much more. The Franschhoek Open Garden Show took place on 6 and 7 November with ten gardens opening their gates for the public, a huge variety of classical and light music performances everywhere, golf tournaments, some to welcome back the "swallows" (the European visitors), a Bonsai Show, Saturday Summer Concerts at Solms/Delta, the very popular Dirtopia Full Moon hike at Klapmutskop on 21 November, Friday evening music performances at La Petite Ferme, are all happening. Most of these events have come and gone, but for those that plan their trips well ahead-now is the time to think of next year. Franschhoek, in the Valley of the Huguenots, has a festival of some kind virtually every weekend and the food and the wines to back it up. A classical music festival, a Bastille Festival, and others have already takn place, but the Franschhoek 'Magic of Bubble' which has been running for 5 years, will take place over the weekend of 3 to 5 December. As in the past, Franschhoek offers visitors an unique combination of French heritage and South African Winelands specialities. Some of the most impressive Champagnes and Cap Classiques are to be showcased in a huge marquee on the lawns of the well known Huguenot Monument. The chefs of the valley will also display their talents. Add to that the normal popular attractions like the Franschhoek Motor Museum at L'Ormarins, the Pierneef Museum at La Motte, and a few others like the sabrage at Cabriere, and you have a reason to be here. For a hiking holiday through the wine lands, hiking in comfort and sleeping in luxury, go to www.Walkingholidays.co.za. But there are various walks available through the famous Cape Fynbos, with different species of flowers showing off all the time. This year is an exceptional year for gardens and flowers as I mentioned in the opening paragraph. I had the good fortune to show customers a Weeping Boerbean tree (Scotia brachypetala) in full bloom, covered in red flowers, even before their first wine tasting. And the roses at the Huguenot Monument which is well known, the garden of Rustenberg with its roses and whatever is flowering at the moment you happen to be there, the bougainvilleas of Graham Beck, the proteas at the Botanical Garden in Stellenbosch and elsewhere - what better job can there be than to show it all to foreign visitors. And everything of course goes along with wine. Wine tasting by trailer, by donkey, by hiking, by cycling, indeed in any possible way. Even by driving if you happen to have the right guide! Although we had always known that there are many leopards in our mountains, they are so shy that we never see them. With movement sensitive cameras that were stratetically placed on estates like Lourensford we now know that there are quite a number still in the mountains. Which brings back the old topic of the Biodiversity in Wine Initiative (BWI) again to the fore. Clients who booked me for a wine tour have seen and heard more on Biodiversity that they thought they would. 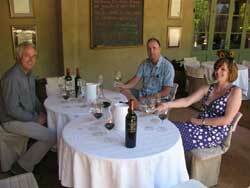 All I can add is that you must plan a trip to the Cape Winelands as soon a possible.